Pequot Lakes, Minnesota Real Estate and Community Info. 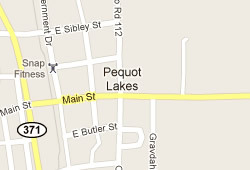 The Pequot Lakes real estate is located deep in the heart of central Minnesota. Pequot Lakes is a town of 2,162 year-round residents, according to the 2010 U.S. census. The city is considered part of the Brainerd Micropolitan Statistical Area, or what locals call the Brainerd Lakes Area, where an estimated 91,000 good people make their home. You will find more than 450 lakes near the town of Pequot Lakes. As part of the Brainerd Lakes Area, Pequot Lakes real estate and homes for sale are situated about 125 miles north of the large metropolitan and suburban area of Minneapolis/St. Paul, making it an extremely popular get-away for Twin City residents and others throughout the region. Even though the city of Pequot Lakes itself is relatively small, it is located near a cornucopia of shopping and dining establishments that are second-to-none. One of the perks of life in a popular tourist destination is that you have an incredibly diverse range of options. The Brainerd Lakes Area offers restaurants to please every taste. You can find everything from sports bars and banquet halls to BBQ restaurants and family friendly cafes. Unique, one-of-a-kind gift shops and retail outlets are plentiful in the Pequot Lakes area, as you might imagine in a resort community. However, the area also plays host to nationwide retailers. For some one-stop shopping, check out the nearby Westgate Mall, Walmart and Best Buy. The City of Pequot Lakes’ Parks and Recreation Department oversees several neighborhood and city parks, most of which provide playgrounds, picnic tables and wide open green spaces. Paul Bunyan, and the accompanying folk lore, figures prominently in the Brainerd Lakes Area’s unique ambiance. All around the area you will see his name attached to everything from local businesses to parks, highways and trails. In fact, the Paul Bunyan Trail offers more than 100 miles of paved pathways for year-round fun jogging, biking and snowmobiling. Along its winding route, the trail runs through the middle of the town of Pequot Lakes. Pequot Lakes real estate offers a variety of special events, including Market in the Park, which takes place every Thursday during July and August in the city’s Trailside Park. Here you can participate in a free yoga session, search for bargains at a flea market and stop for a snack at one of the food vendors. There are also events especially for kids, such as the Bobber Hunt and Bobber Bowling. All of the communities that make up the Brainerd Lakes Area exude a warm, cozy and inviting aura. One of the City of Pequot Lakes’ projects that shine a light on this friendly and open environment is its creation of a comprehensive Housing Plan. The City, in partnership with several other agencies, including the Housing and Redevelopment Authority, has planned, developed and built four new affordable single-family homes the past three years. And there are more in the works. Pequot Lakes School District, Independent School District 186, serves not only the public elementary school, middle school and high school education needs of the city of Pequot Lakes, but also many of the surrounding communities, including Breezy Point, Crosslake and Jenkins. Pequot Lakes residents have a number of medical and health care centers and from which to choose, such as Essentia Health St. Joseph’s Medical Center, Cuyuna Regional Medical Center and Riverwood Health Care Center. Minnesota State Highway 371 is the main thoroughfare for drivers in and around Pequot Lakes. There are a few other transportation options as well, including the Brainerd Lakes Regional Airport, DIAL-A-RIDE and the Express Route (bus) Service. If you are thinking about buying or selling a home, give us a call at (218) 831-4663 or send us an email to explore your options and to find out when is the best time for you to make a move.